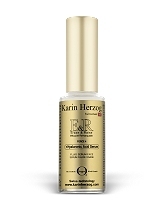 This lifting, anti-wrinkle and moisturizing serum is the very latest from the Laboratoire Dr Paul et Karin Herzog SA. It contains naturally effective ingredients: Hyaluronic Acid, Vitamin E, Camomile and Niacinamide (Vitamin B3) - Niacimamide evens the skin tone, brightens the complexion and diminishes hyper pigmentation. Hyaluronic Acid is incorporated into ER thus ensuring more effective penetration in the initial applications to the skin. Capable of absorbing 10 times its own weight in water, it naturally fills fine lines, smoothes the skin and has a remarkable moisturizing effect. Vitamin E, just one of the ingredients in this wonderful serum, is a proven anti-oxidant and provides natural protection against UV radiation, as well as having a fat-free nourishing effect, suitable for all types of skin. Camomile has a calming effect, inducing a feeling of well-being.. It is mildly antiseptic, creating a sensation of purity and freshness. The Group B vitamin, Niacinamide (Vitamin B3), has considerable affinity with the skin, thanks to its smoothing and regulating effect. Erase & Raise Force 5 is perfectly blended for all skin types and is suitable for use with Vita-A-Kombi 1. This serum can be used every day and as often as you wish. It is your defense against aging, from your mid-thirties and throughout your life. Used by itself, ER gives amazing results. However, combined with the Vita-A-Kombi anti-wrinkle cream from Karin Herzog, the results are even more spectacular. This is why: thanks to its stabilized oxygen content, when Vita-A-Kombi comes into contact with the skin, it releases 2 molecules of water for each molecule of oxygen. Then the Hyaluronic Acid combines with this large volume of released water and fills the intercellular spaces, thus ensuring wrinkle-free skin. Not only that, thanks to the patented Vita-A-Kombi formula, the Vitamin A in this cream is acidified by the oxygen beneath the skin, thus providing the raw material essential for the natural formation of collagen. Hyaluronic Acid and collagen are vital for maintaining the structure of the skin layers. Collagen ensures that the skin remains firm, while the Hyaluronic Acid nourishes and moisturizes the collagen. Now you know: the combination of ER and Vita-A-Kombi is a remarkably effective weapon against advancing age and the formation of wrinkles. Shake the bottle before use. Clean the skin and apply ER to those parts of the face requiring particular attention. Then apply the Vita-Kombi cream again, without massaging, this time all over the face. Allow the product to take effect. Afterwards, you can put on your make-up in the normal way.